The Euro-spec 2017 Ford Mustang was subjected to the Euro NCAP crash tests and scored a dismal two stars. The new Ford Mustang was introduced in 2015 and is also on sale in India. 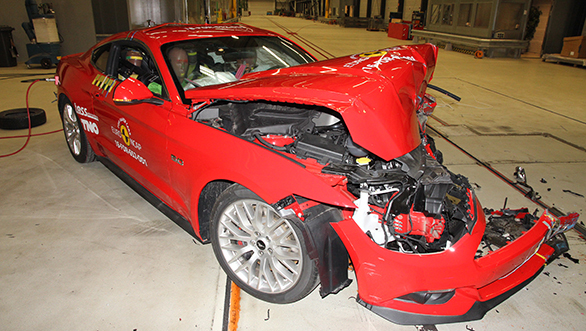 Assessment done on the Ford Mustang in the full-frontal crash test revealed that the driver and passenger airbags didn't have enough pressure in them to stop the occupants' head from hitting either the dashboard or the steering wheel, depending on which side they are seated. 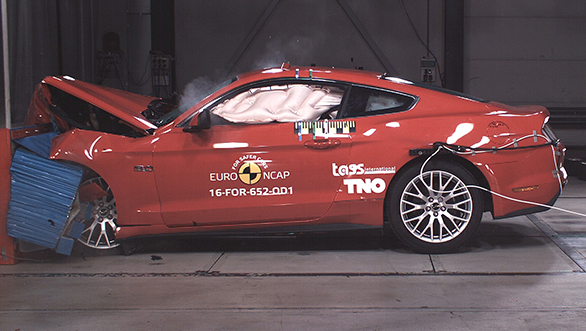 In the rigid barrier test, the front crash test dummy in the Mustang wasn't affected much except for in the chest, where protection was termed as "adequate". The same, however, couldn't be said about the dummy at the rear which suffered injuries to the femur and knees, as well as to the pelvis region. Protection to the chest was also poor as the rear seat belt displayed "excessively high tensile force". In the side barrier test, the Mustang scored good points and all the dummy occupants were more than adequately protected. The same was applicable even for the side pole test. The rear seat dummies though suffered badly with respect to whiplash protection. Euro NCAP says that while the current Ford Mustang doesn't come with automatic emergency braking, the next-gen will have it, and this should help with better whiplash protection at the back. Regarding child protection, the frontal offset crash test returned another "adequate" tag. 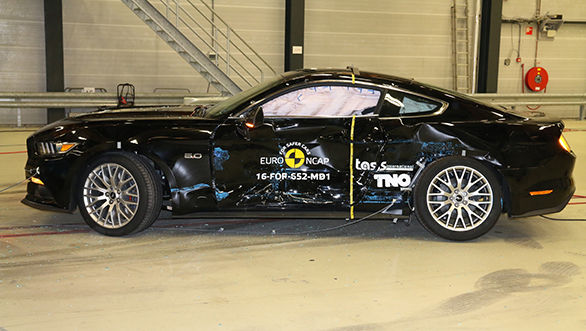 However, the side protection showed that the head of the dummy was affected, thereby negating the good points that the Mustang got for the test. The Mustang also has an 'active bonnet', which gives protection to the pedestrians if there is a crash. The iconic muscle car scored the maximum points (27) that the Euro NCAP had for pedestrian protection. Interestingly, despite scoring maximum points, it should be noted that protection to the pedestrian's pelvic region was deemed as poor. The Ford Mustang sold in India comes through the company's facility in Flat Rock, Michigan. 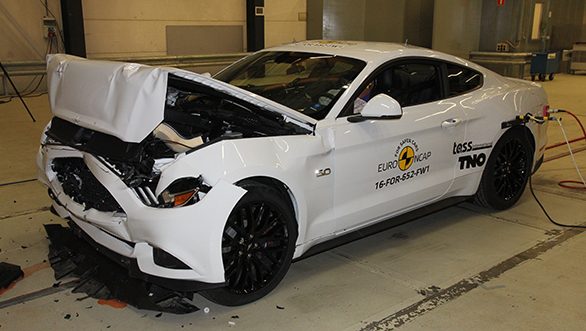 In the US, the Mustang scored a 5-star rating for safety primarily because the crash tests in North America, according to Euro NCAP, are less demanding. The updated Mustang, which will be released globally later this year, is expected to be an improved version, offer more safety aids and improve its crash worthiness.